For my Tarot card readings, I interpret Fours to symbolize safety, security, and stability. 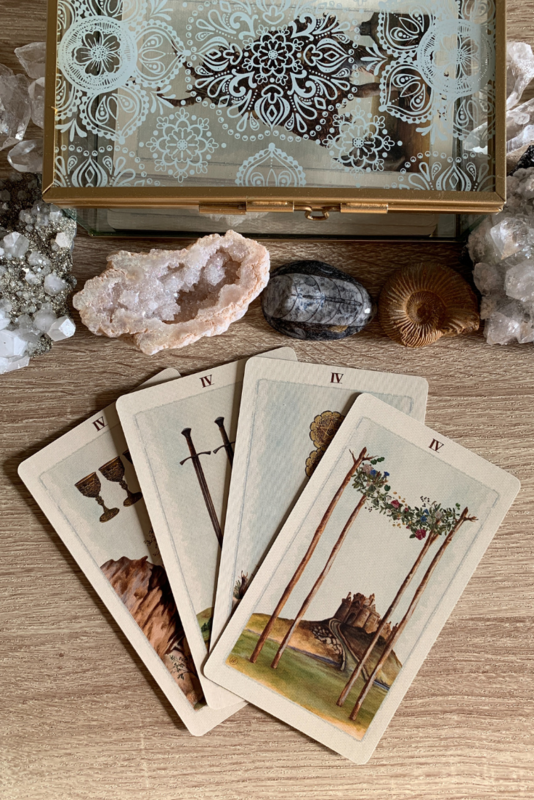 Typically, when Fours appear in Tarot readings, this means that the situation is one which you will eventually find comfort in even if it does not seem that way at present. Below are my personal multiple Four meanings which I have previously designed based on my experience reading Tarot. You can adopt this list or adapt it according to your intuition and feelings about the number 4. Four fours predicts contentment. You will have a very happy life for an extended period of time. You will not experience any negativity or stress. Everything will be joyous and, once you achieve it, your new found peace will not be difficult to maintain. Currently suffering from health problems? Four Fours is a very good card to receive as it predicts healing and the end of worries. While I cannot promise miracles, four Fours is a very good sign. When they appear in a love reading, four Fours represents security in your relationship. Even though you greatly worry about it, you will get commitment from your partner. For business and job readings, four Fours predicts job consistency and stability. The career you’re performing readings on now will set you up for the good life. You will purchase a large home with the help of your work. Three Fours also predicts contentment but your state of peace will be a little more challenging to maintain. While with four Fours you will hold onto the good life easily, with three Fours you will have to put at least (some) effort into keeping everything calm and serene. When they appear in love readings, three Fours can mean that your partner is going to stick around far into the future. You will be very happy together. However, be careful not to let your lover get too comfortable. They may begin to feel that, because your relationship is going so well, they do not have to put any further effort or commit fully to the you. You may already suspect that they have too much of an easy ride. So, if you want kids and marriage, push for it! The same can be said for your career. If everything is currently going well you run the risk of taking your contentment for granted. Or, you could be too comfortable, which is stunting your growth. Enjoy your current situation, but do not let yourself believe that a shake up isn't 1, 5, or 10 years down the road. Personally, I would read two Fours as representing a higher level of seriousness and devotion than what you have experienced previously, for more than one life area. Things will change for the better and leave you feeling as though you are in a more desirable position than you have been previously. Two fours is rather good for love readings, as it can mean that your relationship will generally be a joyous one in the future, even if just for a short time. I will say, that the best way to achieve contentment in your romance, is to act content! Don’t be causing drama or stressing your lover out! Be happy in the moment. For career readings, two Fours simply means that you will get the opportunity to do work which results in higher feelings of wellbeing and fulfilment. 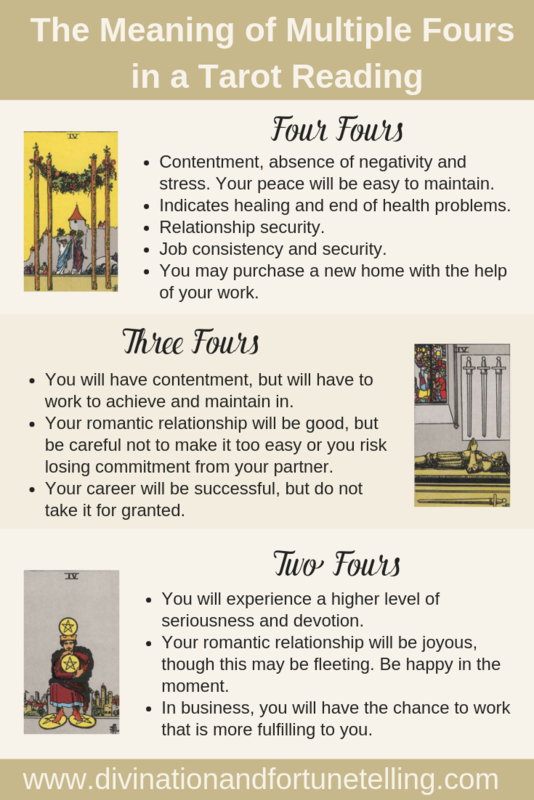 If you’re worried about the security of your job or business, two Fours in your Tarot spread is a positive omen. Art Illustration: What is the significance of receiving lots of Fours in your Tarot card spread? What does it mean when you get four, three, or two Fours in your love, business, career, or general Tarot reading? Do you wonder if multiple 4s has any special significance? Wonder no more because below I am going to give you the low down on what it predicts when you receive lots of fours in your Tarot reading!